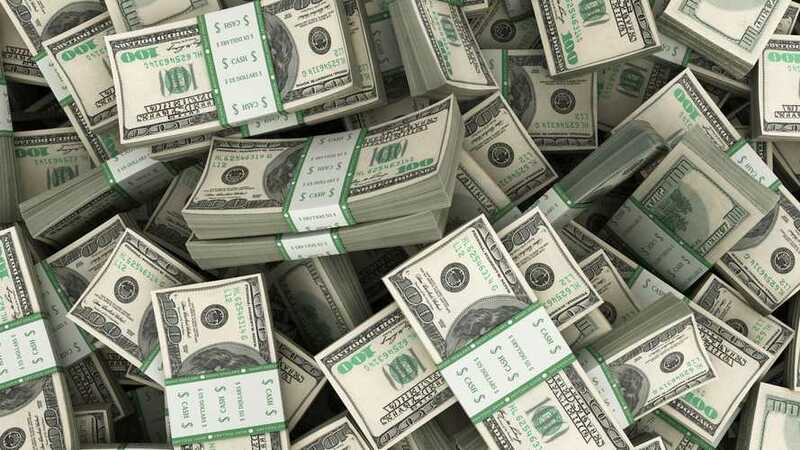 If you haven't bought the whole system new, as I'm doing here, make sure you have all the right parts. 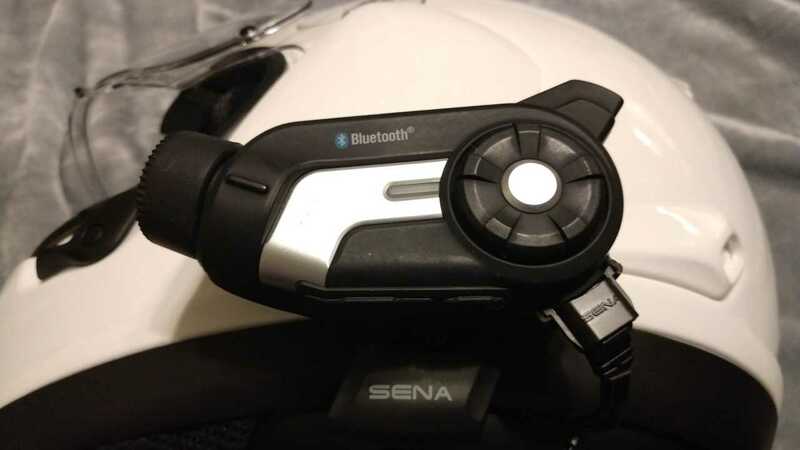 This install is a Sena 10C communicator with a built-in camera. I'm transferring it from my old Arai Signet helmet to my new one. To do this I purchased a Sena 10C helmet clamp kit, and have popped my original camera/comm off my old helmet, and will mount it on this one. 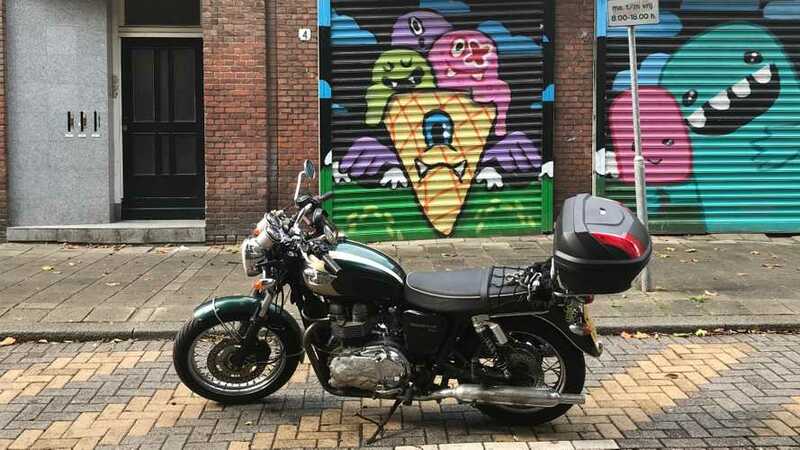 You can absolutely pull the wires out of, and the clamp off of, your old helmet, but I wanted a refresh. Some helmets have deep ear pockets build right into the inner foam of the helmet (I'm looking at you, Shoei) and make speaker positioning stone simple. The Arai is a bit more difficult. I need to thread the speakers through the holes for the chin straps to get them into the correct position right next to my ears. 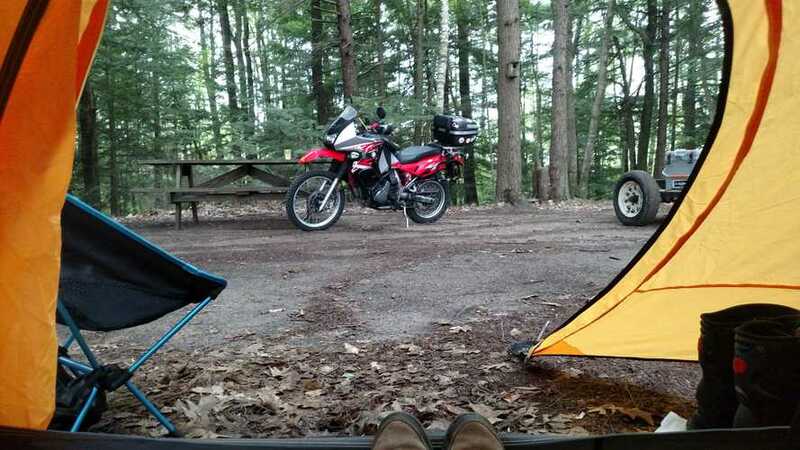 During a ride, when you're wearing ear plugs and there's wind noise, proper speaker position can mean the difference between understanding that your riding partner needs to stop for gas or some other emergency and a conversation consisting of "WHAT?" 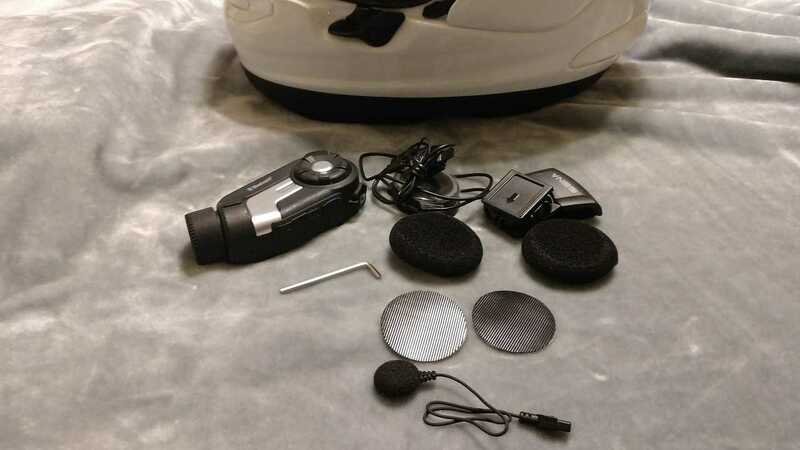 If your helmet, like mine, is full-face and not 3/4 or a modular, you'll want to use the wired microphone. If you do have a half-helmet or modular, the boom mic is better for you. 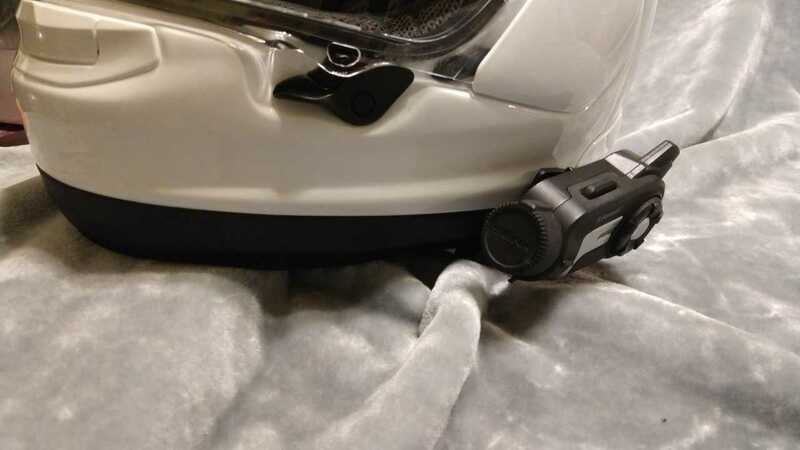 You can either buy a system specifically made with a boom mic molded in, or one where that is one of the options, and you'll need to secure that mic to the helmet separate from the comm system clamp. 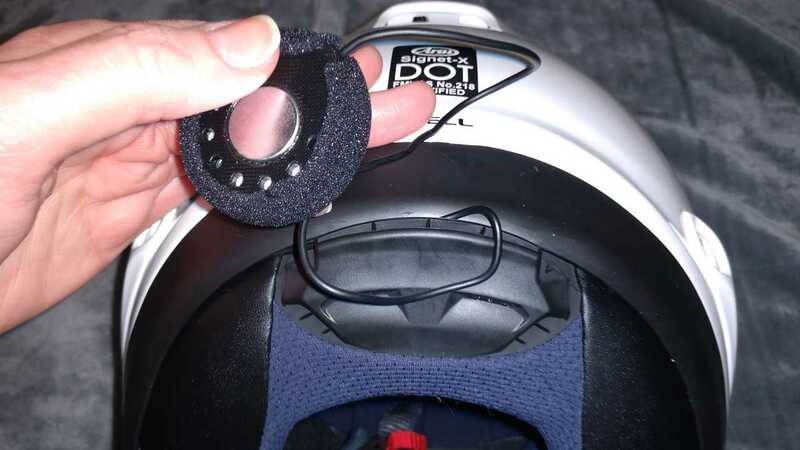 The wire leading to the small, wired speaker is long enough to reach the front of the roomiest dirt bike helmet, so you might need to stuff some of the wire between the hard foam and the outer shell to keep your install tidy. Try not to make more than one 180-degree bend. Position the microphone with the included hook-and-loop sticky mount so that it's right in front of your mouth. On this helmet, that means directly below the chin vent. 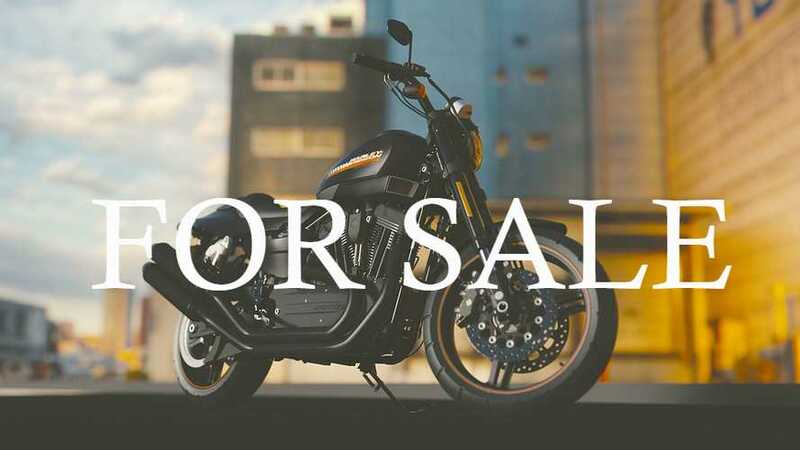 Every comm system is designed to be mounted on the left side of your helmet, under your left ear, so that you can work the buttons without letting go of your motorcycle's throttle. This means the speaker over your right ear has a much longer wire, to reach around the helmet. 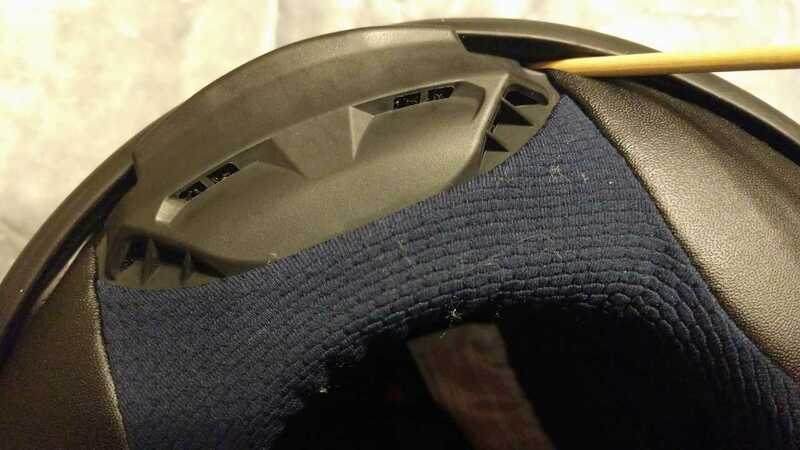 Position the speaker first, then run the wire around the back of the helmet, and tuck it under the trim. ⠀ Cutting Calls: Your Exhaust Is Music To My Ears. Literally. The kit comes with a tiny allen key, which is sized to the small bolts that hold your clamp closed. Open up the clamp by loosening those bolts with the tool, but do not remove the bolts. The clamp will open up enough to slide into the helmet. 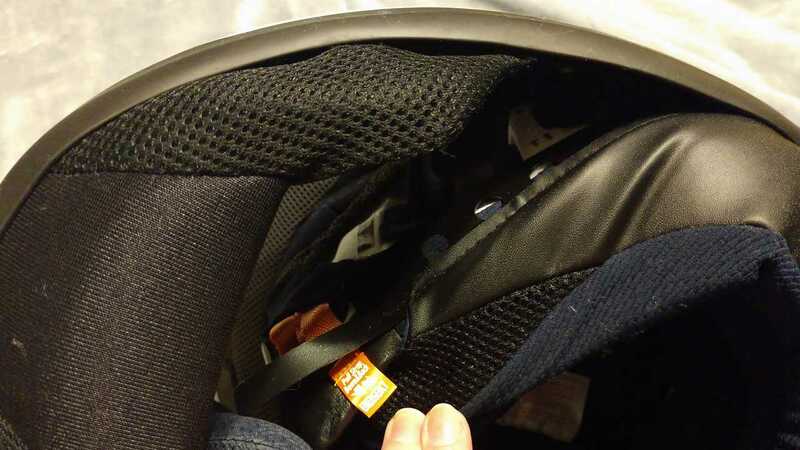 Sneak the thinner side between the hard foam and outer shell of your helmet. Tighten those bolts back down. Be careful with this step, especially if you are using the type of communicator that is removable, and relies on contacts to the clamp like the Sena SMH10. If you tighten the bolts too much the mount can warp and the contacts will not reach, and you will have problems with your communicator. 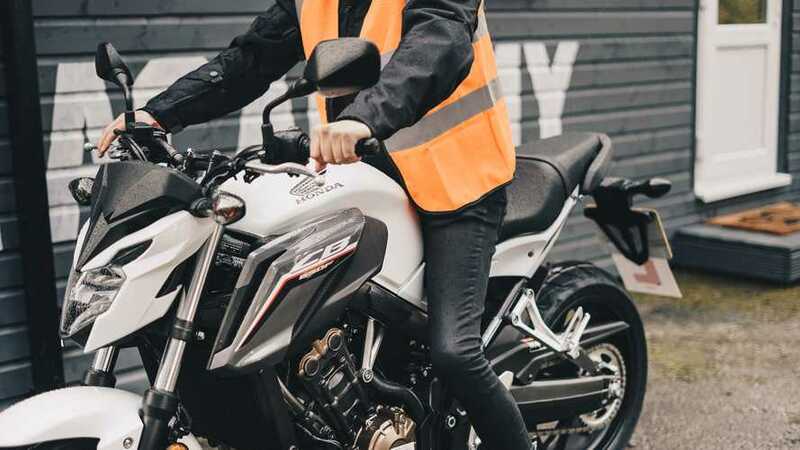 Do not under-tighten those bolts either; you want it to be secure and you do not want the distraction of a comm system falling off your helmet while on a moving motorcycle. It is best to keep that allen key handy, and check your bolts for tightness periodically. Now, you'll want to secure all the wiring, or as much as possible, by wedging it into the helmet between the hard foam and the outer shell. For this step, I like to use a thing called an "orange stick" which is fairly soft wood, and can be found in your local pharmacy near all of the manicure supplies. Do not use anything metal or sharp for this step; you will run the risk of cutting through those tiny wires, and that is an expensive mistake to make. Make sure to follow the wire for the right-side speaker all the way around the back of the helmet. 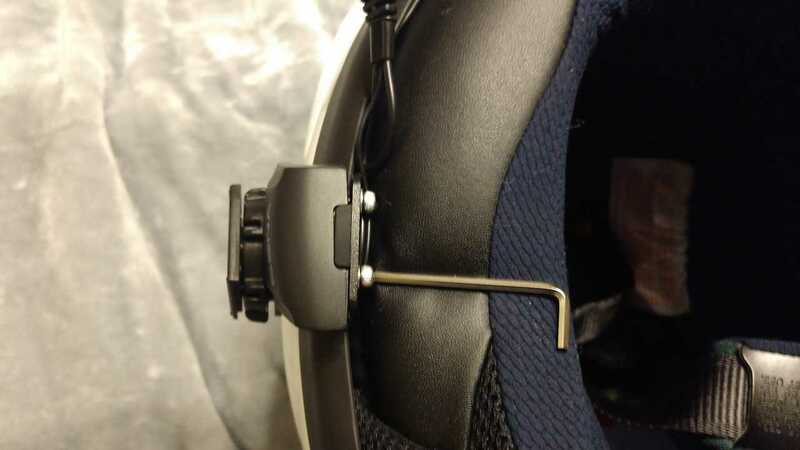 You may encounter a helmet air vent or a solid mount, you'll have to sneak the wire behind some things and accept that it will have to go around others. Again, the soft wood "orange stick" is a huge help here. It will cram that wire into spaces you could never fit your finger. Again, don't use a knife or a screwdriver or anything that has a chance of marring that wiring insulation. 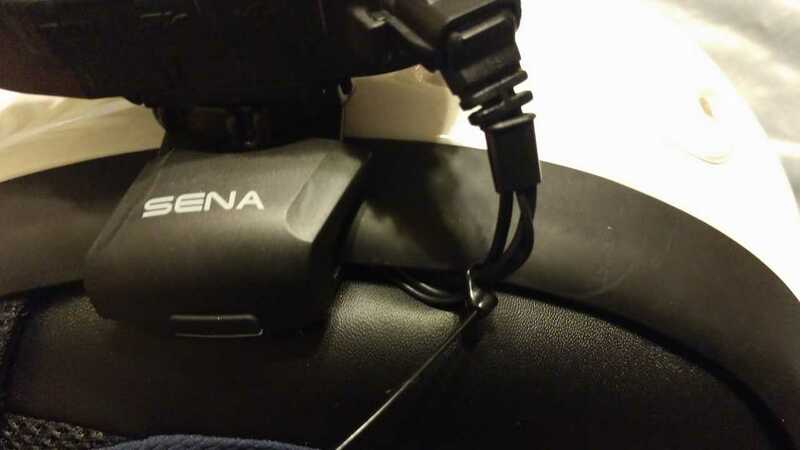 As a rule, when I am installing anything that has multiple wires coming out of the same source (my heated gear controller, any relay, this helmet comm system), I will put a small tie-wrap around all of the wires so that no single wire is ever stressed at the connection. This will mean cutting the stray end of the tie-wrap and being careful about it, so that it is not sharp. You know if you leave it sharp it's going to bite you some time down the road. If you are also installing a comm system with a built-in camera, the only real way to check the position is to go for a ride and take some photos. 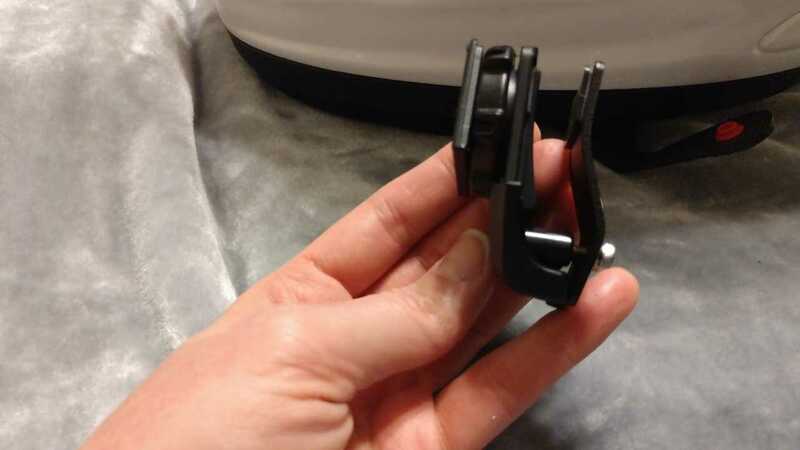 The 10C clamp itself adjusts the camera position up and down, and the camera lens tilts right-left so that your photos can be in line with your eyes, and the photographs and video you take are reliably whatever you're pointing your face directly at. Happy communicating! 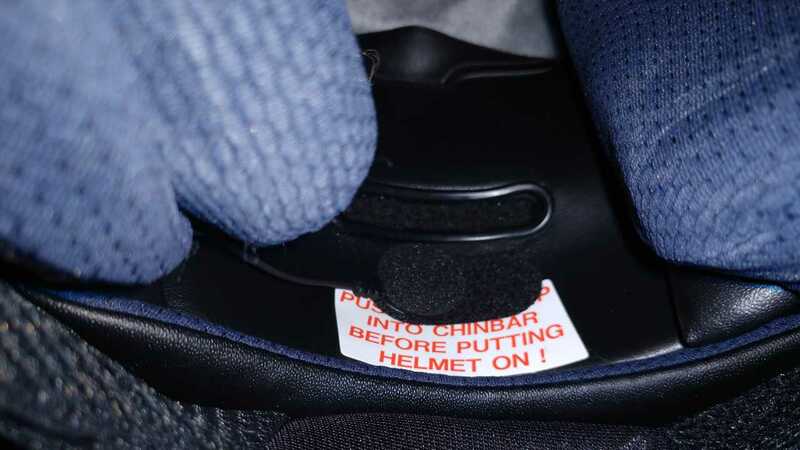 The best way to tackle helmet communicators is to buy one separate from the helmet that already fits you like a glove, especially if you have a hard-to-fit head. If your comm system fails you can replace it, or swap out parts. When your helmet ages out, you can pull the communicator out of it and install it in your new one. 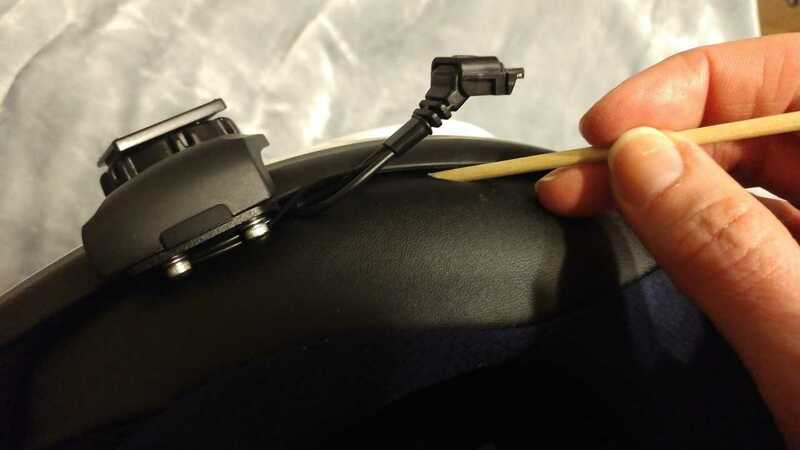 Installing a communicator system into a helmet can be daunting if you've never done it before, so we've made a slideshow with a bunch of tips so that you can get it right the first time, and avoid any "gotchas."